This control box powers the stepper motor, reads the temperature sensor, provides bi-directional serial communication with a PC and allow the user to remotely control and read the state of both TCF-S and TCF-S3 focusers. In order to attain proper connection, three cables must also be obtained: power, focuser control, and PC serial connection. For normal operation, the MODE and LEARN slide switches are placed in the RUN and MANUAL position as shown in the diagram. 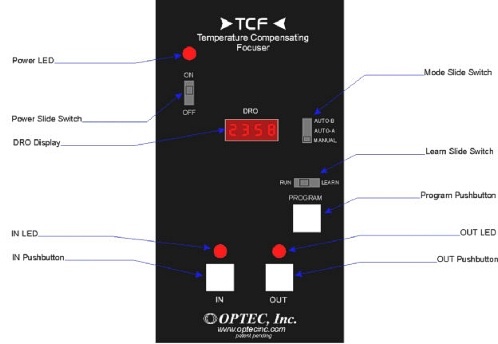 To teach the focuser a new temperature coefficient, the LEARN switch is placed in the LEARN postion and the MODE switch is placed in AUTO A or AUTO B. The position of the focuser in units of "steps" is shown on the DRO display. For the TCF-S, position ranges from 0 to 7000 steps which corresponds to a maximum travel of 0.60 inches. For the TCF-S3, the range of position is from 0 to 9999 steps which corresponds to a maximum travel of 1.00 inches. Important Note! This control box is intended to be used to allow control of a focuser through a computer or from a desktop, not as a hand controller! For handheld operation of a focuser, purchasing the remote keypad is recommended.